The bezel (head) of this ring is enamelled in white with a death's head surrounded by the inscription 'BE HOLD THE ENDE'. The second inscription, 'RATHER DEATH THAN FALS FAYTH', runs round the edge. On the reverse of the bezel are the initials 'ML' connected by a true lover's knot. This ring appears to be both a memento mori ring, which reminds the wearer that she or he must die, and a marriage ring. The second inscription on the ring ('RATHER DEATH THAN FALS FAYTH' ) and the true lover's knot that unites the two initials suggest that it was used as a betrothal or marriage ring by 'M' and 'L', although we do not know who they were. The solemn vows of marriage are associated with death: 'till death us do part'. 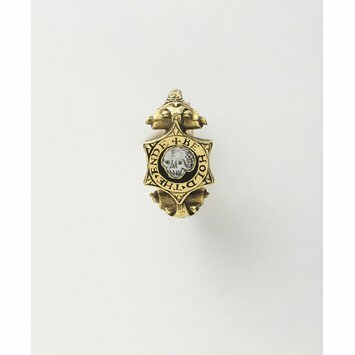 In the past it was thought that the ring was a gift from Charles I (ruled 1625-1649) to Archbishop William Juxon (1582-1663) on the day of the King's execution, 30 January 1649. We do not have any evidence to support this story. 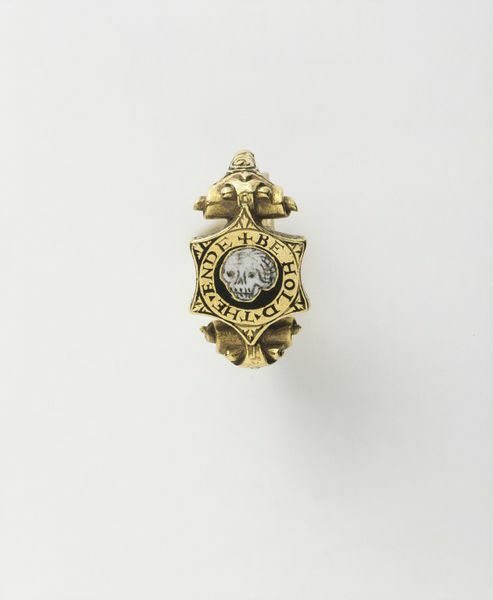 Gold and enamel memento mori ring inscribed 'BE HOLD THE ENDE' and 'RATHER DEATH THAN FALS FAYTH'. England, about 1550-1600.
inscription ‘Rather death than fals fayth’ and the intertwined initials suggest that this ring was a lover’s gift.